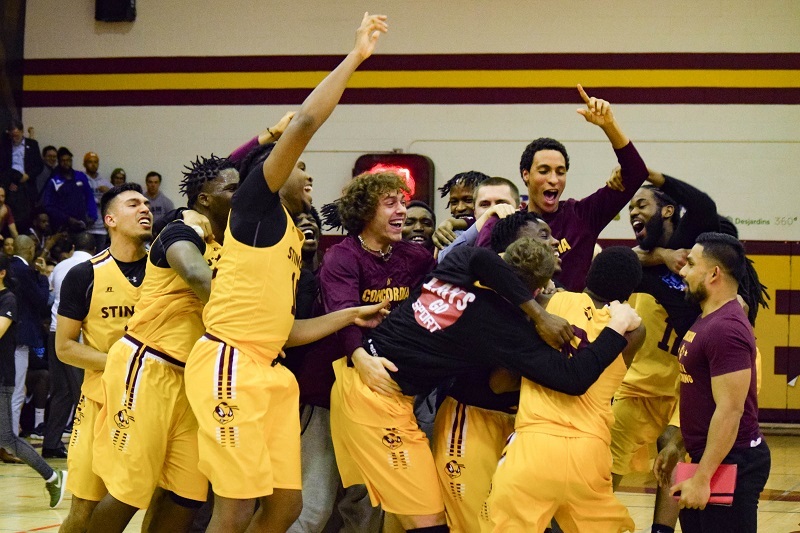 The Concordia Stingers men’s basketball team won the Réseau du sport étudiant du Québec (RSEQ) title Saturday night at the Concordia Gym. They beat the Université du Québec à Montréal (UQAM) Citadins in the final, 73-69. Guard Ricardo Monge accepts the trophy from a RSEQ representative. Photo by Mackenzie Lad. The Stingers finished first in the RSEQ during the regular season with an 11-5 record, and earned the right to host the game. They beat the Bishop’s Gaiters last Wednesday in the semi-final, while UQAM beat McGill in the other semi-final. The Stingers opened the game strong, getting the home crowd behind them. They had a 13-11 advantage after the first quarter, and dominated the second to hold a 27-21 lead at halftime. They started the third quarter strong, but the Citadins battled back and kept the score close. The Stingers celebrate with their trophy. Photo by Mackenzie Lad. A Citadins bucket cut the Stingers’s lead to two points in the final minute of the third quarter. Then, fifth-year guard Ricardo Monge hit a three-point shot to give Concordia a 48-43 lead heading into the fourth quarter. Every time the Citadins cut the Stingers’ lead, Concordia scored timely baskets in the fourth quarter. Even though Simon’s behind-the-back shot looked like a lucky bounce, guard Adrian Armstrong said it shows how hard the team has worked through the years. Simon finished the game with a double-double, collecting 18 points and 10 rebounds. Monge led the Stingers with 19 points, while Sami Ghandour had 17. The Stingers will now play at nationals in Halifax from March 7 to 10. The Stingers women’s basketball team were also playing in the RSEQ final Saturday night. They lost to the Université de Laval Rouge et Or 75-55 in Quebec City. More to come. Main photo by Mackenzie Lad.